We offer a class that will get you acquainted with the longarm machine and how you can use it in different ways. After taking the certification class, you will be able to rent a machine to finish your quilts! 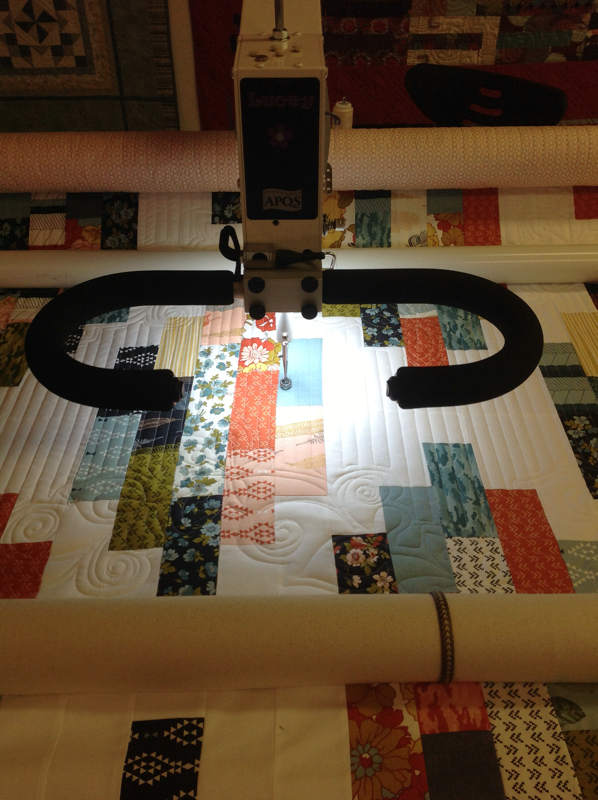 We also have a second class to get you going with Free Motion Quilting on the Longarm! There are some FAQ's listed below, after the class descriptions. Tuesday, Jan 22, 1-4 p.m.
Saturday, Jan 26, 1-4 p.m.
Tuesday, Jan 29, 1-4 p.m.
Thursday, Feb 7, 6:30 - 9:30 p.m.
Wednesday, Feb 27, 1-4 p.m.
Thursday, March 7, 6:30 - 9:30 p.m. I also set times on request, so just email me if there is a time you want to do this! all supplies are included, just bring yourself! Whether or not you have used a longarm machine before, this 3 hour class will have you stitching conﬁdently before the class is over. - advance your quilt to line up each pass. Saturday, Feb 9, 2019, 1:00 p.m to 4:00 p.m. 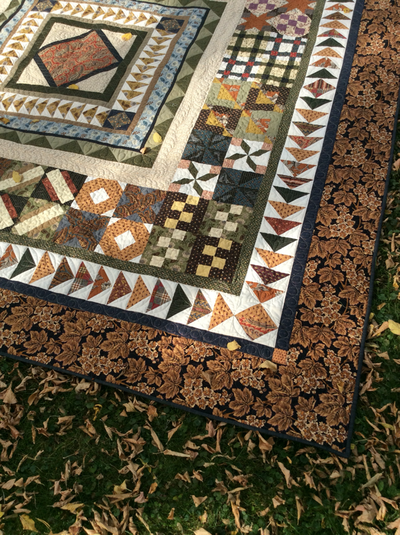 In this class you will develop a library of free motion quilting designs to draw from when you want to quilt a project. You will practice designs and emerge with a set of stitched samples. this class is very different then the certification class. It is for the new owner of a long arm machine. A lot will be covered in the class terms of understanding how the machine works, thread tension, how to load a Quilt, how to use a pantographs, how to approach orders and blocks, ruler safety, routine maintenance, and using your machine for a business. it is not a hands on quilting class, but it is discussion, lecture and demonstration. there will be ample time for us to cover topics which are of particular interest to you. If you have purchased a new APQS long arm machine in the past year you may be able to take this class for free as part of your purchase. or pop into the shop to book a time. we have a calendar posted that shows the times that are available. Our studio is at 412 44th St E, just 3 blocks north of Circle Drive off Faithful Avenue. Drop in and see us! What Pantographs do you Have? When you take the certification class you will get little pictures of the patterns. When we add to them there are additional sheets you can add to your binder. Right now we have 70 pantographs. 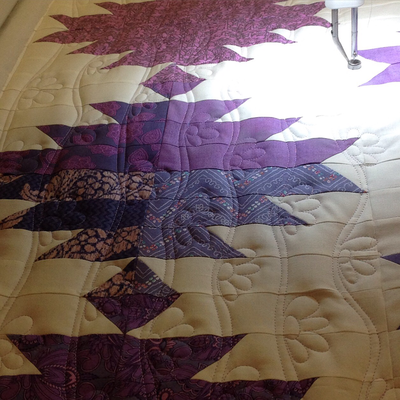 free motion quilting and custom designs usually take a bit longer, so if you have a large project, you might want to split the project over different days, especially if it becomes uncomfortable for you to stand for over 3 hours. The supervisor comes in to work at that time, and must be paid regardless of whether the renter comes or not. We have had some experiences where the person has come very late, or hasn't shown up at all. You will be able to pay for 10 hours and get 2 more hours free. We have a binder where we keep a record kept of your times, and they just get marked off as they are used. The supervisor will be there to help you with how to do it, and will give you assistance, especially the first times you use the machine, until you feel confident to work independently. We are considering the "Valet" service, where we load your quilt for you for $25.00, then you just pay for the time starting when you begin to quilt.... let us know what you think of that! The price of the rental includes Glide threads and prewound bobbins. If you want to bring your own thread, you can do that. We do have some prewound 100% cotton bobbins if you want to purchase them. we also have metal bobbins and a bobbin winder.